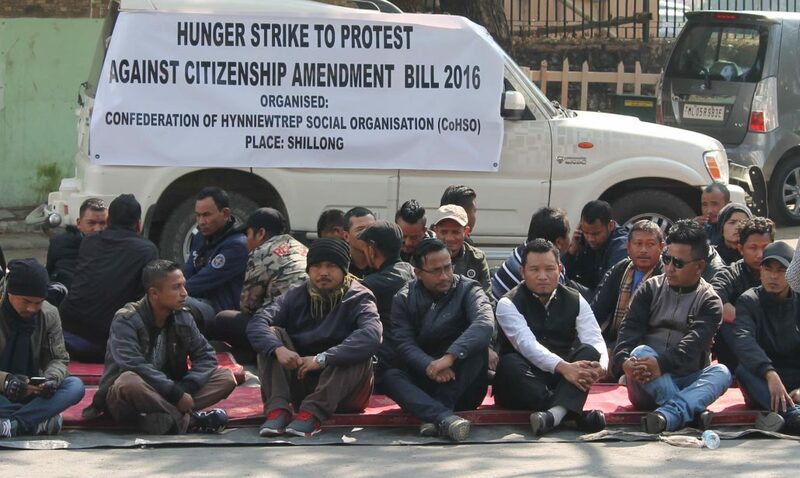 The Confederation of Hynñiewtrep Social Organizations (CoHSO), an umbrella of 14 NGOs of Meghalaya staged a hunger-strike in Shillong on Thursday demanding withdrawal of the Citizenship (Amendment) Bill, 2016. The members of the Confederation, which comprises 14 NGOs and supported by the All Garo Hills Joint Action Committee (AGHJAC) has also asked the MDA government to consider its demand to implement the Inner Line Permit (ILP) in the state. The Confederation further questioned the timing in which the BJP-led NDA government has approved the amendment to the Sixth Schedule of the Indian Constitution alleging it to be an attempt to divert the attention of the indigenous people of the region, according to reports. “The Bill which seeks to provide citizenship to immigrants from Pakistan, Afghanistan and Bangladesh, if implemented will no doubt pose serious threat to the indigenous population of the state and Northeast as a whole,” Kharjahrin was quoted as saying. He also demanded that the state government begins the process of updating the National Register of Citizens (NRC) immediately. He further said that the ILP is an ‘instant cure’ to the citizenship bill to prevent illegal immigrants from entering the state while the NRC will ensure flushing out those who are residing illegally in the state.